I absolutely couldn't wait to get started on Wanderlost by Jen Malone! This book seriously sounded like the perfect book to start off my summer break, and it totally was!! The main character in this story, Aubree, sounded a lot like me. She was perfectly content with the boring life that she had in Ohio, and planned to spend the summer by the pool with her friends. But this trip to Europe is exactly what she needed. It forced her so far out of her comfort zone, and I loved every part of the journey that she took. And let's not forget the people that she took the journey with, these seniors were seriously some great characters, I adored them. The storyline for the book was fun and completely enchanting. Not only did it get me super excited for summer, but it also made me want to travel to Europe and experience all the things that Aubree experienced on her awesome journey. One day I will totally make that happen, and I absolutely can't wait!! 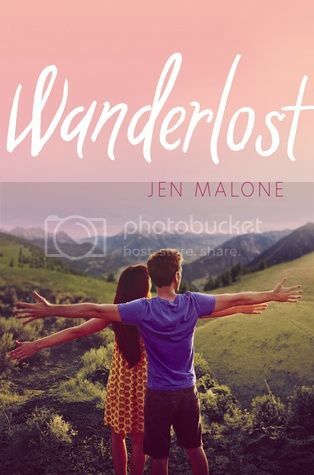 Overall; If you love books about road trips and traveling, with a sweet romance on the side, you're totally going to want to check out Wanderlost!! It's a perfect summer read, so add it to your TBR right now!! I'm super excited to read more by Jen Malone in the future!